If you want to sell cards on Cardmarket, you have to know the card's language. Especially for Asian cards, this is not always simple for everybody, so we created a guide that should help you distinguish cards from all languages on sight. At the end of each section, there is also a description of the sets being printed in that language, as it doesn't seem to make a lot of sense to wonder about whether you are holding a simplified or traditional Chinese Arid Mesa when in fact there is only a simplified Chinese version. As you can read this, I presume that you can identify an English card. These cards are sold all over the world and are the baseline for most of the comparisons in this article. Every regular Magic set other than Renaissance has been released in English. French uses the same standard 26-letter Roman alphabet as English. The language is most easily identified by its frequent use of accents 1 . ´, `, ^ 2 , and even ' 3 (not an accent) are found in French words. Also you will find the ç only on French and Portuguese Magic cards. On French cards the subtype is distinguished from the type by a : 4 instead of a -. French cards are sold in France, Belgium, and Switzerland. The first set that was translated to French was Revised Edition. Each later Core Set is also available in French. The first expansion translated to French was Ice Age and again each later expansion other than Portal Three Kingdoms is available in French, too. 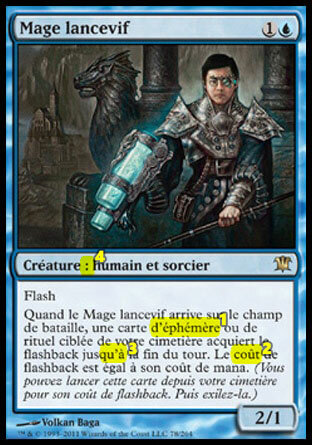 Considering the length of the text, this French Snapcaster Mage doesn't even have a lot of accents. German cards use the same Roman alphabet as English cards, but the German language has some special letters. There are the umlauts ä, ö, and ü 1 , and the ß which is particular to German only. Also distinguishing is that German text boxes are usually the most crowded because sentences tend to grow about 30% in the translation from English to German. Likewise German words usually have more characters 2 than words in most other languages. Finally the letter combination of sch 3 you will find often in German, but rarely in other languages. German cards are sold in Germany, Austria, Switzerland, and Belgium. While they are comparatively unpopular in Germany, especially American collectors seem to have a soft spot for them. The first set that was translated to German was the Revised Edition. Each later Core Set is also available in German. The first expansion to be translated to German was Ice Age and each later expansion other than Portal Three Kingdoms is available in German, too. A German Snapcaster Mage. Nine lines of text are quite much, but it is more the amount of long words in contrast to almost no very short words that gives German a distinctive look. Italian uses the same Roman alphabet as English, but j, k, w, x, and y are excluded. They may occasionally occur in loanwords, though 1 . Two accents can be put on vowels: ´ and ` 2 . Italian words end on vowels the vast majority of the time, at least 95% 3 . The words that don't are most often names or loanwords. Whenever the word 'tap' or 'untap' is written out on an Italian card the 'TAP' or 'STAP' is completely capitalized. Italian cards are sold in Italy only. The first set that was translated to Italian was Revised Edition. Each later Core Set is also available in Italian. The first expansion translated to Italian was The Dark. However Legends was released in Italian after The Dark and Fallen Empires was not made in Italian at all. Beginning with Ice Age each expansion other than Portal Three Kingdoms is available in Italian. Although j, k, w, x, and y are not used in Italian, there is a k in "flashback". Spanish uses the same standard 26-letter Roman alphabet as English, but they have a special 27th letter, the ñ. Also the k and w are only used in words of foreign origin, so you will only very rarely see them on a Spanish card. Most Spanish words end either on a vowel, l, n, r, or s 1 . Finally the Spanish use one accent in their language, the ´ over vowels only 2 . Spanish cards are sold in Spain and all parts of Middle and South America other than Brazil. The first set that was translated to Spanish was 4th Edition. Each later Core Set is also available in Spanish. The first expansion translated to Spanish was Ice Age and again each later expansion other than Portal Three Kingdoms is available in Spanish, too. In the text of this Spanish Snapcaster Mage there is not a single k or w. All words end on a vowel, l, n, r, s.
Portuguese uses the same standard 26-letter Roman alphabet as English, but the letters k, w, and y have only recently officially been integrated into the language and are only used in words of foreign origin. The ã 1 is not an official letter, but the use of this character is particular to Portuguese anyway. It is often used in conjunction with an o as in São 2 . The letter combinations of nh and lh 3 are also much more frequent in Portuguese than in other languages. As French, Portuguese occasionally uses the ç 4 . Finally they also use the accents ´ and ^ 5 . Portuguese cards are sold in Portugal and Brazil. The first set that was translated to Portuguese was 4th Edition. Each later Core Set is also available in Portuguese. The first expansion translated to Portuguese was Ice Age and again each later expansion other than Portal Three Kingdoms is available in Portuguese, too. Despite the long text there is not a single k, w, or y in this Portuguese Snapcaster Mage. Russian uses the cyrillic alphabet. Some of these letters look like Roman letters. a, b, e, m, h, o, p, c, t, and x look like Roman letters, but the rest is of a different, albeit similar appearance. Russian cards are sold in Russia. They are occasionally sought after for their different looking letters. The first set that was translated to Russian was 9th Edition. There is only a limited edition black-borded printing of Russian 9th Edition. In most other languages there are white and black-bordered versions of a language's first set. Each later Core Set is also available in Russian. The first expansion translated to Russian was Ravnica and again each later expansion is available in Russian, too. Cyrillic script looks extremely regular as almost all non-capitalized letters are of the same height. Of the Asian cards, Korean are most easily distinguished. Korean letters are constructed mostly of straight lines and circles 1 , and most of the straight lines are horizontal or vertical. All things considered Korean text looks very geometric, regular, and compartively simple. Korean cards can also easily identified by their use of a regular period at the end of sentences. All other Asian languages use circles for periods while the Koreans use dots 2 . Korean cards from the first printing era (around 4th and 5th Edition) seperate type and subtype only by an empty space; no dashes or colons. Korean cards are sold in South Korea. Korean cards are often highly sought after by collectors, leading to premiums that are only rivalled by Japanese cards. The first set that was translated to Korean was 4th Edition. There is only a limited edition black-borded printing of Korean 4th Edition. In most other languages there are white and black-bordered versions of a language's first set. Korean Core Sets were discontinued after 5th Edition and reintroduced with Magic 2012. The first expansion that was translated to Korean was Visions. Korean was discontinued after Urza's Saga and reintroduced with Innistrad. The text on this Korean Snapcaster Mage might have been constructed with a ruler and a circle. Japanese and Chinese look rather similar to the untrained eye, but once you have figured it out, they will never look the same to you because they are actually not that similar. Written Japanese is composed of several scripts. The Japanese scripts, Hiragana and Katakana are combined with chinese kanji and occasionally even Roman letters. For the numerals Arabic numbers are used as well as the Sino-Japanese numbers. The effect of this combination of letter system leads to a rather inconsistently looking type. Original Japanese characters have a lean, elegant, and simple look. But mixed in between the Japanese characters are always the Chinese kanji which have their own elegance, but are way more complex 1 . They are often composed of more than a dozen lines. For the vast majority of Japanese cards there is a very easy way to recognize them. If the name uses any kanji this kanji will have a translation into Japanese script above the kanji. There are two lines of text then, the kanji as a regular part of the text flow and one or a few Japanese letters in a very small font above the chinese character 2 . If you see this you can be absolutely sure that the card is Japanese. If you don't you cannot be a 100% sure that the card is non-Japanese, but the chance is very high. Of the 264 cards of Innistrad only two have names written entirely in Japanese character. This is most likely to occur when the name of the card is a proper name. In Innistrad for example the two exceptions are Liliana of the Veil and Olivia Voldaren. Japanese cards also have the period at the end of the sentences, which looks like a circle, at height of the baseline, but you cannot distinguish a Japanese card from a newer simplified Chinese one by this technique 3 . Japanese cards are sold in Japan. They are often highly sought after by collectors. Especially foil Japanese cards can be vastly more valuable than regular examples of a given card. Their worth is usually only rivaled by Korean versions of these cards, which for many sets don't even exist, though. The first set that was translated to Japanese was 4th Edition. Each later Core Set is also available in Japanese. The first expansion translated to Japanese was Mirage and again each later expansion is available in Japanese, too. Kanji and Japanase characters next to each other give Japanese script a rather heterogeneous look. Chinese characters can range from simple two-stroke characters to extremely complex figures that are composed of dozens of strokes. Actually if you envisage the characters being made with a quill you can imagine why chinese letters look what they look like. The lines are always straight or have a slight curving at most. If you compare Chinese to Korean and Japanese characters you will notice that Chinese characters have the least curves, their lines are not necessarily horizontal or vertical, but they are never strongly curved. All things considered Chinese script is most easily distinguished by its very dense appearance. If you look closer these characters (to a non-Asian) look like you could never learn to write them because they are so complicated. If you have a card with a subtype like a creature then there is a foolproof way to distinguish Chinese cards as well. Here the card type is seperated from subtype by a ~ 1 instead of the usual -. Also different subtypes are separated by a / 2 that is tilted at a 45 degree angle. Chinese cards are sold with two different character sets, the traditional Chinese characters as are still used in Taiwan, and the simplified or modern Chinese characters as are used in China. These are sometimes referred to as T-Chinese and S-Chinese. With a lot of experience you can distinguish these two character sets as well. Not surprisingly simplified Chinese characters are usually less complicated than their traditional counterpart 3 . But there is a trick which makes distinction way easier. In Chinese sentences are finished with a circle, an equivalent to our period. For newer cards the positioning of this circle is different in traditional and modern Chinese. In Traditional Chinese the circle is positioned halfway between the top and the bottom of the margins of the script, approximately where you would expect the middle bar of an E in our script 4 . In Modern Chinese on the other side the circle is positioned lower, touching the baseline 5 . Thus if you hold a card which is not a vanilla creature, you can easily distinguish traditional from modern Chinese cards, too. Older simplified Chinese cards can be distinguished as well, though. If you take a look at the characters of a Chinese card, in most cases you will be able to imagine each character put into a roughly rectangular box. Each character touches the borders of that imaginary box and fills it pretty uniformly. With the older simplified Chinese card that is not so. The characters there look way more organical. Modern Chinese cards are sold in China. Traditional Chinese cards are sold in Taiwan and Hong Kong. Chinese cards probably vary the most in their value. Based on regional availability they are sometimes considered to be a bit more or less valuable than English cards. The first set that was translated to traditional Chinese was 4th Edition. There is only a black-bordered version of traditional Chinese 4th Edition. Traditional Chinese Core Sets were discontinued from 9th Edtion to Magic 2010, but reintroduced with Magic 2011. Each later Core Set is also available in traditional Chinese. The first expansion translated to traditional Chinese was Visions. Traditional Chinese was discontinued from Darksteel to Rise of the Eldrazi. Since Scars of Mirrodin every set has been available in traditional Chinese. The first set that was translated to simplified Chinese was 5th Edition. There is only a white-bordered version of simplified Chinese 5th Edition. Each later Core Set is also available in simplified Chinese. The first expansion translated to simplified Chinese was Urza's Saga. Simplified Chinese expansions were discontinued from Urza's Legacy to Prophecy and reintroduced with Invasion. Since Invasion every expansion has been available in simplified Chinese. Note: In some cases the Gatherer and magiccards.info seem to have different ideas on which version of a card is traditional and which modern Chinese. As far as I can tell magiccards.info seems to be the more reliable source here. Simplified Chinese above and traditional Chinese below. Magic is not usually printed in these languages. However the Prerelease cards of the invasion block were printed in dead languages and the Prerelease cards of the Odyssey block were printed in non-Roman scripts. Thus exist Roman Raging Kavu, Ancient Greek Questing Phelddagrif, Sanskrit Fungal Shambler, Arabic Stone-Tongue Basilisk, Cyrillic Laquatus's Champion, and Hebrew Glory. These cards are each the only one in that particular language with the exception of Laquatus's Champion as Magic cards are available in Russian since 9th Edition. In this table, we have listed the Magic card types in the different European languages. This is helpful for distinguishing languages as it's easy to look at the card type 1. In this table, we have listed the Magic card types in the different Asian languages. This is helpful for distinguishing languages as it's easy to look at the card type 1. 1 The "Planeswalker" entry is only for Lorwyn cards as translations for the Planeswalker type were used in Lorwyn only. "Summon ~" was used until Fifth Edition on creature cards. "Enchant ~" was used until Ninth Edition on aura cards.